On Wednesday, December 2, 2009, Eucharistic Adoration began at the Divine Providence Adoration Chapel on the grounds of Precious Blood Catholic Church. The chapel is located in the parish center, the former convent, along Gregory Lane. By the grace of God, and with the help of Father Angelo Quadrini, F.D.P. (“Sons of Divine Providence”), Adoration of the Exposed Blessed Sacrament was made available for Dubois County Catholics at the Providence Home Chapel in Jasper, Indiana, on February 13, 2006. Due to the many responsibilities of Father Angelo and with his blessing, it was decided to move Adoration to the Divine Providence Adoration Chapel which was opened on December 2, 2009, at Precious Blood Parish in Jasper under the guardianship of Father Gary Kaiser. The faithful are welcome to visit Jesus in the Chapel, which is supported by all area parishes. Perpetual Adoration is held at the Chapel, which continues without interruption 24 hours a day, 7 days a week. Adoration of the Blessed Sacrament is a devotion in which the consecrated Eucharist remains exposed in the monstrance for veneration by the faithful. Our Lord continues to call us to come closer to Him. “Guardians of the Eucharist” take that step by making the commitment and sacrifice of spending an hour in prayer each week with our Lord, truly present in the Eucharist. 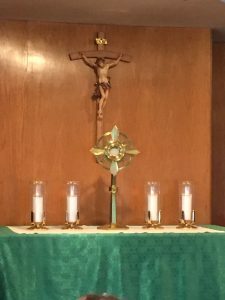 Those who make Perpetual Adoration of the Eucharist an important part of their lives soon find Christ in the Eucharist becoming more central to their lives. Perpetual Adoration wins many graces for the individual, the family, the parish, the diocese, the universal Church, and the world. Anyone who makes the sacrifice to participate in this sacred endeavor will be blessed a hundredfold. He or she will come to a relationship with Jesus in the Blessed Sacrament. Let us make every effort to find the time to spend an hour with Him who loved us so much that He suffered and died for our salvation that we might be blessed with eternal life with Him in His glorious kingdom of heaven. This hour Jesus wants you to spend with Him is spent in any way you want. You may bring your own prayer books, use the books in the chapel, read the Bible, pray the Rosary, or just sit, relax and enjoy the sweet peace that comes from simply being in the Presence of God. Print this passage, take it with you and imagine that Jesus is speaking just to you. New adorers and substitutes are always welcome. If you suspect God is calling you to watch one hour with Him call 812-630-8382 or send an email to dp@adorationmanager.com and someone will contact you.